The CNA salary in Oklahoma can vary depending on where in the state you work, as wells as your experience level, time on the job and other factors. If you’re looking for a job that allows you to help people while also earning a good salary a certified nursing assistant is a great place to start. A CNA position is a good way to enter a career in the health care sector and gain experience. Not only are there always plenty of jobs in this sector, the pay can be good as well. 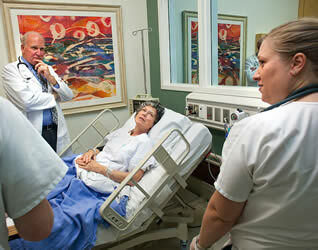 A CNA works in various health care facilities seeing to the daily needs of the patients. CNA jobs are available in hospitals, clinics, nursing homes, adult day care canters and assisted living facilities. Some CNAs also find employment in private homes, providing care to individual patients. In the United States, a CNA earns an average salary of $12.02 an hour. This comes to $23,726 a year. In Oklahoma, according to Indeed.com, the average hourly salary of a CNA is $11.86. This means an Oklahoma based CNA can earn around $22,889 a year. If further education is important to you, then Oklahoma is one of the best states to be a CNA. The state offers several free training programs for CNAs. In addition, many employers will often reimburse the cost of a further training program if you agree continue to work for them. In Oklahoma, experienced CNAs earn more than rookie CNAs. A new certified nursing assistant will probably earn an annual salary of around $18,000-22,000, compared to a veteran CNA who can get up to $29,000. This is usually because most large – and high paying – health institutions in the states will not hire a CNA with no experience. Because of this, you will need to begin your career at a small company with lower wages. Don’t worry too much though as many companies are quick to reward loyalty and you will find that, after a few months, you will be getting a higher salary and could be eligible for benefits such as vacation and sick leave. Aside from self-employment, the best salaries for CNAs in Oklahoma are available for those employed by hospitals. The highest salaries for hospital-based CNAs are for those in the ER or ICU. Even if you did not train as a CNA in Oklahoma, it might be worth your while to consider job hunting in the state. The number of jobs available to CNAs are anticipated to grow quickly. According to projections from the Oklahoma Security Commission, there will be a 17.4% increase in demand for CNAs in the state in the coming decade. The nursing and residential care facilities are also expected to grow in 2016. To learn more about CNA classes in Oklahoma check out our training facility list. School trainees are required to complete at least 75 hours or skills training with 16 hours completed in a medical facility to prepare for the proper way to care for patients in a medical setting.